What does it mean when a horse ‘drops’ his shoulder? What does a horse dropping his shoulder mean? An example of a horse ‘dropping his shoulder’ would be a horse traveling to the left (counter clockwise) in a circle or around an arena. As the horse travels this path the rider feels them ‘dropping their shoulder’ into the direction of travel (left in this example) which causes the horse to track to the inside of where the rider desires to be. If left unfixed the horse will often travel more and more to the left. To compensate for this ‘dropping’ the rider is often instructed to use the inside leg or rein or both to ‘hold’ the horse up. In this example the rider will often apply pressure with the left leg and/or the left rein to push the shoulder back out (to the right). I dislike the phrase ‘dropping its shoulder’ because generally the more the rider takes the responsibility of ‘holding up’ the shoulder…the more it allows the horse to lean into the pressure. Much like a dog pulling on a leash as it is led, part of the problem lies in the handler holding pressure and allowing the dog to pull. 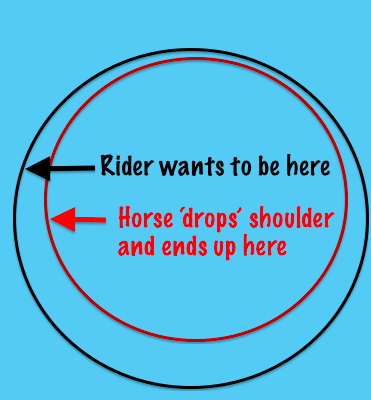 I would rather replace the term ‘dropping the shoulder’ with ‘falling in’ or simply turning; because if the rider didn’t ‘hold up the shoulder’ the horse would turn. 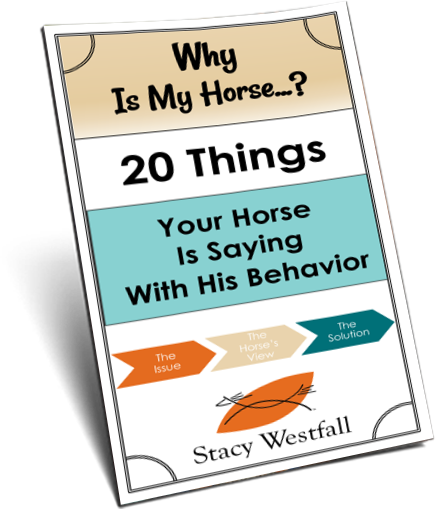 Fixing a horse that is turning too soon often seems easier to understand than fixing one that is ‘dropping his shoulder’….although it could be argued that they are the same thing. 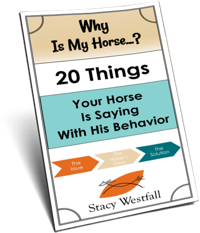 This may seem like a small difference in phrasing but when coaching I have often found that it is the key to getting the rider to find a true ‘fix’ for the problem. In the example above, if the rider didn’t use the left leg or rein to ‘hold the horse up’ the horse would simply turn to the left. The horse isn’t dropping something, he is turning early. The easiest way to prove this is to NOT hold up the shoulder. The rider will be pleasantly surprised to find that they are still upright….nothing dropped…but they will also find that the horse has turned earlier or sharper than the rider wanted. difficult body frame to hold- many events favor horses who carry an animated body position where the horses body frame carries a curve. This is more difficult than carrying the body straight and some horses while trying to move straighter will turn. The subtle difference of viewing this issues from another angle may lead you to solve your problem. My horse (a little grade gelding I bought at auction) was real bad about dropping his shoulder. I fixed it, and refresh the fix every time he’s had a lay off, by using Stacy’s spiral in/ spiral out exercise. I use her cloverleaf pattern, anchor the inside rein by holding the fringe on my chaps, and work the cloverleaf using only my inside leg and outside rein. Greatest exercise ever for getting horses to break at the pole, bend their ribcage, give to the bit, balance, and frame up. My horse was also real bad about slinging his head around whenever you picked up on bit. This exercise works wonders on that, too. Best investment I ever made was Stacy’s DVDs: Colt Starting & Basic Body Control. This is huge item for me. When riding in a circle; I try to maintain position, collection and cadence. At a trot not to bad, at the lope not so good. This is my next milestone. Good article on “Dropping the Shoulder” or “Falling in on the circle”. I have had this exact problem for years especially in canter, with the horse leaning in and me desperately trying to balance up :-D. We finally solved it through balancing the horse through a diagonal shift in weightbearing from insight fore to outside hind. Learned about this through ARR (Klaus Shöneich, Germany), first from ground and then from back. Was really a great experience to get away from the concept of “holding” and into “setting free and strenghten”. It was a different way of thinking for me and took some time to adapt, but works perfectly well with whatever riding style one would have. Also, many of my clients have horses who slow their stride in the front shoulder and “swing” their hind around a circle, to avoid the bend, this also makes them “divebomb” their cirlces 😛 And this also takes a different fix then the overbent horse! Thanks for this. My instructors are always telling me that my horse is dropping his shoulder, and all I do is ‘hold’ it up. Hopefully this way of thinking will help the next time I ride. Agree with Tiffany, would love excersices to use to correct this problem. I agree with Tiffany, you didn’t say how to fix this. I am assuming that you still add the inside leg and inside rein. Tiffany Dowdy Bell, she explained how to fix the problem above. For the life if me, I cannot get my horse to pick up the correct lead going to the left. It is very apparent that he is more comfortable going to the right, but not left. It means a very bumpy ride. Several more experienced riders have tried as well. Sometimes he will for three or four steps the perform a BEAUTIFUL flying lead change. I have tried opening up the shoulder and been severe about it…by that I mean putting my right foot clear up on his right shoulder and left foot way back on the left leg…..Still cannot get it figured out. Is cantering in tight circles to the left the way to cure this? We have been working on it for almost five years and still have not accomplished this goal. Also, what would be the best way to begin to teach the in the saddle sidepass? I have a walk down the road, roll in the mud kind of guy. He does both of these things wonderfully. Side passes would be very convenient to know in some circumstances and the correct lead would be much safer and a less bumpy ride. Obviously, he slips with the incorrect lead!!! Leslie- The best thing would be to get a pro to watch your horse. Sometimes this much one sidedness can be an indicator that the horse is sore and avoiding that move. If the horse also avoids that lead on a lunge line and turned loose then your odds are even better that it is soreness. A vet could help confirm or rule this out. But how do you fix this problem???? Yes, Suggestions for correcting this would be nice. I have a gaited horse (Rocky Mountain), and I’m told that his lateral gait can make it more difficult for him on a circle – that could be the case, or it could be me (I know it’s partially me!). He certainly seems to have a hard time trying to hold the curve, often trying to point his nose to the outside of the circle, or as you said, be straight, and of course, “dropping” to the inside. Through trial and error, I’ve had some luck with asking him to give his hip to the outside of the circle (left leg ask for one step to outside, on this circle), but I have no idea if this is an acceptable practice for getting correctly balanced circles. Tiffany and others….I thought I would get everyone thinking with this blog and then give follow up blogs as the ‘fix’ changes a bit between a rider caused issue or a horse caused issue, etc. Watch for the follow up and in the mean time think about what is causing your particular issue. I LOVE the way you explain things! Thank You!